(Show #487) While global shipping is a massive and lucrative business that benefits people in so many ways, there is another side to it. 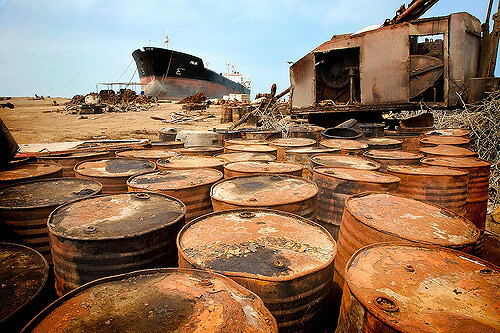 Once the massive vessels need to be retired, they have to be broken down and their valueable materials recycled. Doing this using well equipped workers and proper facilities comes at a cost, and for decades, companies have been getting around that cost by sending their ships to parts of the world like India and Bangladesh where neither equipment nor proper facilities are required. Where no one is looking, and where toxic materials can be dumped and handled with minimal complaints. My guests on today’s program from the Brussels based NGO ShipBreaking Platform are among the most well informed and dedicated observers of this practice, advocated to stop harmful practices and push companies to act responsibily. A major challenge in an industry few people follow or feel able to influence, listen in and hear what is going on out there. First of all welcome to all the new people who have probably met me at this conference here in Paris. Many of you probably aren’t into the world of blogs and podcasts, so the fact that you clicked over to my website is a major milestone… maybe. It was day two of the transport strikes, and officially day 1 of the TBLI conference. I did my best not to go around handing people cards to explain who I am, I also avoided explaining myself too often. I’ve worked too dam hard and have too many issues on my mind to take the constant trouble of explaining what I do to strangers at conferences. At one point I ran into some very laid back new friends who work in the world of press releases. They liked my flickr cards, the ones that I made purposely almost too small to read, with photos of my adventures on the back. In their case, I described what I do on this site, and the topic came up of what would I say if I were having a drink with one of the big corporate representatives at this conference. The thought was fairly disturbing.. to have a drink with the likes of Suez, Shell, Coca-Cola (ha!).. they’re all here. As much as I might want to challenge them with questions about their human rights records and the human suffering their actions have caused in the world, I must admit I don’t think – in the moment – I would have the nerve. I bet they would even be polite, or charming in some way, so that I’d almost forget who they worked for. Thats the worst part, potentially, of attending too many of these events… you rub elbows with individuals working for some of the most notoriously inhumane companies in the world, and you might find – as if probably often the case- they are actually nice people. But then what happens to everything you know about their companies actions? You put it to the side maybe.. separate the person from the corporation, perhaps. For my part I’ve steered clear of them. Instead I’ve enjoyed the company of people who work for organizations dedicated to making real change in the world, respecting the rights and health of humans everywhere. And let me tell you, there are some very inspiring individuals here. In the coming days I will feature some of these stories in both text and podcasts, so stay tuned.